French police have banned "yellow vest" protesters from the Champs-Élysées in Paris on Saturday after rioters destroyed businesses last week. The government for the first time is deploying soldiers to help maintain security, both in Paris and in Nice. "Sentinelle guys are all soldiers - we don't know how to keep order," the soldier said, speaking on condition of anonymity. Politicians from across the political spectrum also voiced concerns. Bruno Retailleau, leader of the main opposition Republicans in the Senate, told the France 5 television channel that the decision was a "serious mistake". 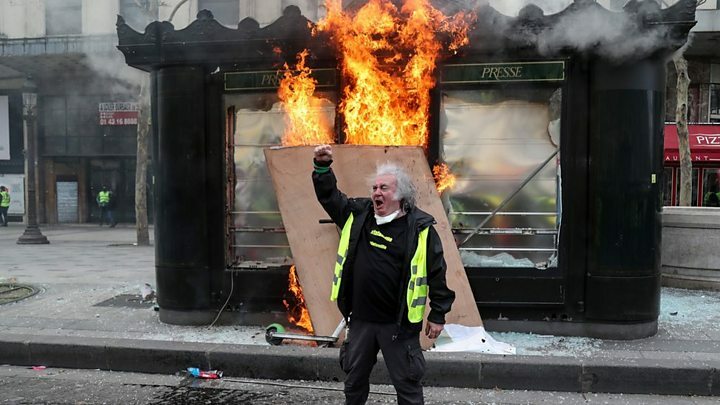 The "yellow vests" ("gilets jaunes") started protesting in November, initially because of fuel tax rises. Last Saturday shoppers and tourists watched in horror the scenes of lawlessness along the Champs-Élysées, as groups of rioters looted and burned with police seemingly powerless to intervene. The government says that can't be allowed to happen again. But that's raised worries about what happens if troops, armed with assault rifles and untrained for riot control, find themselves cornered by a mob. The government says it won't happen because police will always intervene first. Maybe - but the main lessons from four months of yellow vest protests in Paris is that they move quickly from place to place and are very unpredictable. Following last week's riots, which resulted in more than 120 arrests, Mr Macron vowed "tough" action. Concessions were offered to protesters late last year as the movement was picking up speed - including €10bn (£8.5bn; $11bn) designed to raise incomes of the poorest workers and pensioners. But this has not put an end to the riots. For the past month the president has toured France, listening to local mayors and citizens as part of his "grand débat" - a big national debate. Gilets jaunes: How much anti-Semitism is beneath the yellow vests?